With increasing landfill costs, there is often a significant opportunity for Local Government to save money on domestic clean-up stream disposal costs by increasing resource recovery of key materials particularly vegetation, bulk cardboard, plastic containers and mattresses. In addition, the clean-up stream often contains a large volume of hazardous materials such as e-waste, chemicals, paint, car batteries and building materials, which are liabilities for Council, collection entities and waste facility operators. Monitor compliance with Council booking policies. 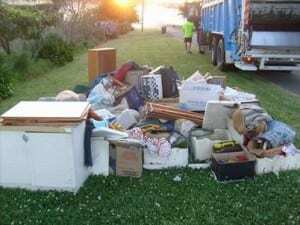 The objectives are to determine the composition and quantity of materials present at the kerbside, as well as to provide information that will identify the potential for reducing the disposal of material and increasing re-use and recycling. Many clean-up items presented are also ideal for charity sales and swap shops without the need for reprocessing. The optimal waste minimisation plan can be developed following the audit to create a strategy for change.